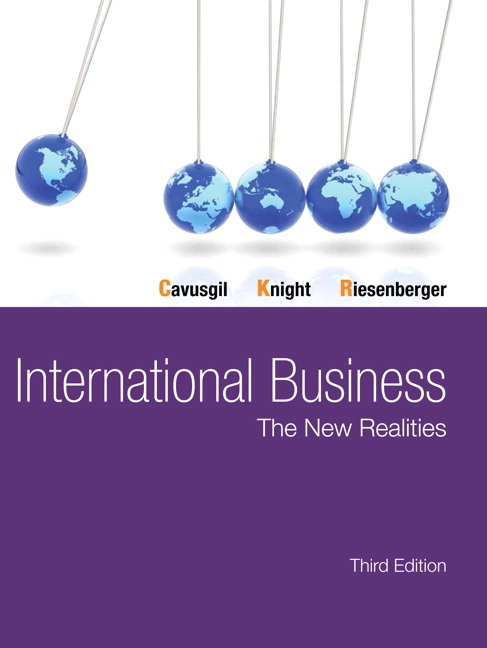 International Business: The New Realities caters to a millennial student audience, the most diverse and educated generation to date. The book speaks to students of the technological age, facing a diverse and evolving economic environment fueled by the Internet and multimedia sources. By addressing issues such as the competitive job market and challenges faced by advanced economies, the text preps students for international business in our modern world. The Fourth Edition plays on millennials’ characteristics to engage them in the material. This includes their reliance on technology, their drive towards achievement and helping their communities, and their desire to obtain skills they can apply towards meaningful jobs. The authors understand what motivates millennial students and builds on their goals to help students obtain successful careers in international business. MyManagementLab is an online homework, tutorial, and assessment program designed to work with this text to engage students and improve results. Within its structured environment, students practice what they learn, test their understanding, and pursue a personalized study plan that helps them better absorb course material and understand difficult concepts. Students, if interested in purchasing this title with MyManagementLab, ask your instructor for the correct package ISBN and Course ID. Instructors, contact your Pearson representative for more information. UPDATED! A focus on Visual Learning puts more emphasis on interactive media and videos, as well as exhibits, maps, and visual learning aids. NEW! Watch It features list one or two custom-designed videos on international business that provide real-world context for text material. Collaborative learning features encourage students to work in groups, facilitating their communication through the Internet, social media, and other forms of technology. Relevant knowledge and job-related skills are showcased as examples and activities throughout the text that help students gain the skillsets they’ll need in an international business environment. Digital Platforms play to millennials’ preference to access content digitally to enhance engagement, self-pacing, and the ability to customize content to individual student needs. They also help ensure timely, up-to-date content is accessible to students. Contemporary issues that matter to millennials provide more relevant and in-depth coverage of IB topics such as emerging markets, developing economies, growth of the service sector, risks in IB, globalization and technology, women in IB, and other important trends. Meaningful content covers areas such as ethics, corporate social responsibility, and sustainability in international business. Practical treatment of managerial issues bridges the gap between learning the material and applying it to a future career. UPDATED! Fewer chapters in the text make room for a greater focus on foundational content. NEW! Chapter organization aligns learning objectives more systematically with chapter sections. 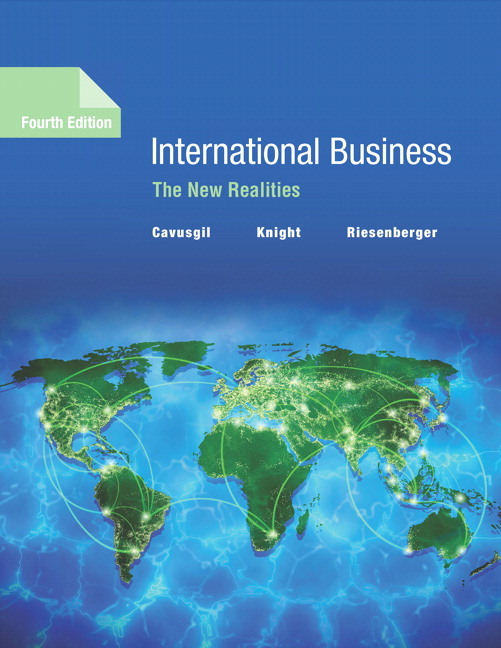 Opening and closing cases in each chapter feature modern firms and subjects such as Apple, Disney, Facebook, Harley Davidson, H&M, born global films, social media in China, and the global movie industry to stimulate student desire to learn more about international business. NEW! More exercises and activities have been added to improve students’ critical thinking and problem solving skills. NEW! Exhibits enhance readability and make explanations easier to understand. All content is contemporary and reflects trends in international business today. NEW! Career Toolbox exercises simulate real-world decision making by presenting students with managerial challenges and decisions professionals must make in international business. NEW! A group project on international corporate and social responsibility lets students debate the role of corporate social responsibility in international business. UPDATED! A You Can Do it--Recent Grad in IB Biographies feature has been expanded with three new biographies that feature actual students that have embarked on fascinating careers in international business, inspiring students to do the same. An Organizing Framework at the beginning of each chapter systematically explains major chapter topics and how they relate, enriching text flow. Opening Stories and Global Trends Vignettes reflect contemporary trends in IB. Ethical Connections Vignettes illustrate common dilemmas managers encounter between ethical norms and business practice. The Chapter Warm-up helps you hold your students accountable for learning key concepts in each chapter before coming to class. The assignment consists of basic questions related to topics in the text, and gives students the chance to access their eText to read about the topics in question. Grading and item analysis in the assignment allow you to see what students know and don’t know. A personalized Study Plan. MyLab generates a personalized Study Plan for students based on their test results, which links directly to interactive, tutorial exercises for topics where they need the most help. These exercises provide unlimited practice and include guided solutions and multimedia learning aids to give students additional help. Enhanced eText keeps students engaged in learning on their own time, while helping them achieve greater conceptual understanding of course material. The worked examples bring learning to life, and algorithmic practice allows students to apply the very concepts they are reading about. Combining resources that illuminate content with accessible self-assessment, MyLab with Enhanced eText provides students with a complete digital learning experience–all in one place. MediaShare for Business provides a robust video library and a powerful interface that help students connect course concepts to the business world. Each video in MediaShare for Business’s carefully curated collection is tagged to course learning objectives and accompanied by pre-built auto-graded assignments. Engaging, real-world video content, including new current events videos developed specifically for Cavusgil, and time-stamped assessment hold students accountable for understanding how what they’re learning in class can be applied in their future careers. In addition, instructors can still assign their favorite YouTube clips or original content. Additional tools for sharing and commenting facilitate contextualized feedback on presentations, videos, and business plans uploaded as part of individual or team assignments. Branching, Decision-Making Simulations put your students in the role of manager as they make a series of decisions based on a realistic business challenge. The simulations change and branch based on their decisions, creating various scenario paths. At the end of each simulation, students receive a grade and a detailed report of the choices they made with the associated consequences included. Video Exercises explore a variety of business topics related to the theory students are learning in class. Quizzes assess students’ comprehension of the concepts covered in each video. Writing Space. Better writers make great learners–who perform better in their courses. Designed to help you develop and assess concept mastery and critical thinking, the Writing Space offers a single place to create, track, and grade writing assignments, provide resources, and exchange meaningful, personalized feedback with students, quickly and easily. Thanks to auto-graded, assisted-graded, and create-your-own assignments, you decide your level of involvement in evaluating students' work. The auto-graded option allows you to assign writing in large classes without having to grade essays by hand. And because of integration with Turnitin®, Writing Space can check students’ work for improper citation or plagiarism. Watch It features list one or two custom-designed videos on international business that provide real-world context for text material. Chapter organization aligns learning objectives more systematically with chapter sections. More exercises and activities have been added to improve students’ critical thinking and problem solving skills. Exhibits enhance readability and make explanations easier to understand. Career Toolbox exercises simulate real-world decision making by presenting students with managerial challenges and decisions professionals must make in international business. A group project on international corporate and social responsibility lets students debate the role of corporate social responsibility in international business. 1. Introduction: What Is International Business? Professor Cavusgil has been mentoring students, executives, and educators in international business for the past four decades. A native of Turkey, his professional work has taken him to numerous other emerging markets. Tamer serves as Fuller E. Callaway Professorial Chair at Georgia State University’s Robinson College of Business. He is also a visiting professor at: Leeds University Business School, U.K.; University of South Australia; and Xi’an Jiaotong University. Previously, Tamer served as Senior Fulbright Scholar to Australia and taught at Monash University. Tamer also served as a visiting professor at Manchester Business School, and held the Gianni and Joan Montezemolo Visiting Chairat the University of Cambridge, U.K., where he is also an Honorary Fellow of Sidney Sussex College. At Michigan State University, where he served for 21 years, he was the inaugural holder of the John Byington Chair in Global Marketing and Founding Director of CIBER. Professor Cavusgil is an elected Fellow of the Academy of International Business, a distinction earned by a select group of intellectual leaders in international business. He also served as Vice President of the AIB, and on the Board of Directors of the American Marketing Association. Tamer has authored more than two dozen books and some 200 refereed journal articles. His work is among the most cited contributions in international business. He is the founding editor of the Journal of International Marketingand Advances in International Marketing. He serves on the editorial review boards of a dozen professional journals. Tamer holds a Bachelor of Science degree in business and economics from the Middle East Technical University in Ankara, Turkey. He earned his MBA and PhD degrees in business from the University of Wisconsin. Professor Gary Knight has been teaching international business for more than 20 years. A native of the United States, he has lived and worked in many countries around the world. Gary has been Helen Simpson Jackson Chair in International Management at Willamette University since 2012. He is also Visiting Professor at the University of Southern Denmark, Odense. He was professor at Florida State University for 15 years where he directed the school’s International Business Program. Gary has been an invited speaker at institutions worldwide and developed study abroad programs in Asia, Europe, and Latin America. He has won several awards, including the Jerry Hudson Award for Excellence in Teaching, Willamette University, and Best Teacher in the MBA Program, Florida State University. Gary has co-authored six books and more than 100 refereed articles in academic journals and conference proceedings. His research emphasizes international business strategy, international services, emerging markets, and internationalization of small- and medium-sized firms. Gary won the Hans Thorelli Best Paper Award for his article “Entrepreneurship and Strategy: The SME Under Globalization.” Along with S. Tamer Cavusgil, he won the 2014 Decade Award at the Journal of International Business Studies for their article on born global firms. Gary is ranked in the top five percent of scholars who have published in the Journal of International Business Studies since 1995, based on the number of articles published. He recently was ranked one of the top 10 scholars in the United States, and top 15 worldwide, in international business research impact based on Google Scholar citation data. He is on the editorial review boards of several international journals. He has provided expert testimony on global commerce and small business to the U.S. House of Representatives. Gary is Chair of the Academy of International Business, Western United States Chapter. Prior to joining academia, he was Export Manager of a medium-sized enterprise, directing the firm’s operations in Canada, Europe, Japan, and Mexico and supervising some 50 distributors. He enjoyed a brief career in banking and as a teacher inJapan. Gary earned his MBA at the University of Washington and PhD at Michigan State University, both in international business. Earlier degrees were in finance and modern languages. He also attended the University of Paris in France and Sophia University in Japan and is fluent in French, Japanese, and Spanish. Professor Riesenberger’s teaching activities centered on leadership and global project management at the Thunderbird School of Global Management, Corporate Learning Group. His passion is to help students and young professionals develop the managerial skills frequently required of new graduates entering careers in international business. John is an accomplished author, consultant, and international executive with senior executive positions in major pharmaceutical firms, biotechnology firms, and pharmaceutical agencies. John’s international business career spans over more than three decades in the global pharmaceutical industry. He has conducted business transactions in twenty-one countries. Currently, he also serves as the president of Consilium Partners, Inc., a pharmaceutical consulting firm with clients in pharmaceutical, biotechnology, and pharmaceutical agency firms. He worked for 30 years with Pharmacia & Upjohn and The Upjohn Company as a senior international executive. His experience covered a diverse range of divisional, geographic, and functional accountabilities. His most recent position was as Vice President of Global Business Management. He also served as Corporate Vice President and Chief Commercialization Officer for a biotechnology firm and as the Executive Vice President of a pharmaceutical science agency. John serves as a member of the Board of Directors of the Ontario Institute for Cancer Research.He was a member of the Global Advisory Board of the American Marketing Association. He served as an Executive in Residence at the Michigan State University Center for International Business Education and Research. He served on the Editorial Review Board of the Journal of International Marketing. He served as Chairman of the Industry Advisory Board’s “Value of Marketing Program,” SEI Center for the Advanced Studies in Management at the Wharton School of the University of Pennsylvania. He is the former chairman of the Pharmaceutical Manufacturing Association Marketing Practices Committee. Professor Riesenberger is the coauthor, with Robert T. Moran, of The Global Challenge: Building the New Worldwide Enterprise (McGraw-Hill, London). John holds a Bachelor of Science degree in Economics—Business and an MBA in Management from Hofstra University. He attended the Harvard Business School’s International Senior Management Program.